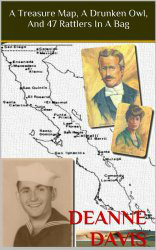 True tales of high adventure in the lawless days of early California and Mexico. These are the stories penned in my Grandfather's (Solon Kimball Weed), journals and from letters sent by Kim Weed, my Dad. It's the search for love, land, and gold: "The fever never lets go!" Those are pictures of my Dad, Kim, in his WWII Navy uniform and my Grandparents, Solon and Helena Weed. It's a Kindle book.